Re: Old SocalT member from OK.
Too bad Ford can't, or won't, get a responsive, in manual shifting mode, auto trans. My trans is not even good for spirited tight canyon running due to the delays in downshifting. Upshifting is a bit better but still is not quick, and, there is some dash pot function that RET could not tune out, that hangs the throttle open for seconds after you lift. This was a major annoyance at the Streets of Willow. In full auto mode, it upshifts lightning fast at the programed 7000 RPM, and my 1/4 mile passes at Famoso were made with all the nannies off in drive. But, if the tires break loose in full auto, generally on the 1->2 upshift, it shifts to 3rd and bogs and then kicks back down to 2nd. This is a definite run killer and it is also embarrassing on the street. I really hate the auto trans even if it is quicker at the strip than a manual trans car. PMachy was the real talent that day at Famoso. Somehow he got off the starting line using his patented let the clutch out and feather the throttle technique, on his summer performance tires at full street tire pressures (he had the Brembo brake, handling package with the 19" rims with the standard 3.31 axle ratio), and then he threw perfect full throttle shifts. His 12.67 pass, with his dead stock car, with paper plates still, was amazing. But, he since sold that car and got some hybrid Ford, so he could run the car pool lane, and get great fuel mileage. Too bad as just before he bowed out of driving a performance car, he admitted to me that his younger brother was the Stig, and that he, PMachy, taught his brother, who had, and still has, less talent, how to drive. The loss of such a genuine talent saddened me. Note: There are also videos of me droning around the Streets on my youtube channel but they are not at all exciting. 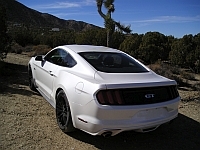 All I learned that day was that then 5.0 is a fairly decent handling Mustang for a base model with soft base suspension, and fading brakes, and only Nitto 555's for tires, which are really not all that sticky. CheeseHead wrote: Rocking the auto with the paddle shifters over here, I feel like letting the car shift for me now a days! I'll definitely keep you posted on how the car feels once I break the 1,000 mile marker. Yep, Bryan! Always had a great time with you guys! Didn't you post under Insomniac? "Too bad as just before he bowed out of driving a performance car, he admitted to me that his younger brother was the Stig, and that he, PMachy, taught his brother, who had, and still has, less talent, how to drive. The loss of such a genuine talent saddened me. " Sure did, I remember your posts as well!